In the 1990s, Mark Bide and I used to chair a program for VISTA Computer Services called “Publishing in the 21st Century.” We’d do a “white paper” every year and run conferences twice a year each in New York and London. The subject was digital change in publishing and the purpose was, simply, to think it through. The conferences developed a pattern. Mark would open the show with a summary of our research. He’d be followed by a couple of outside speakers and then I’d wrap up with what we took to calling a “walk on water” speech. I got a lot of practice doing big vision stuff. Part of the pattern was that Mark would start each conference by reiterating that book publishing is not one business, but many. The procedures and business metrics for a publisher of directories bore no resemblance to that of a college textbook publisher; a sci-tech publisher had a different business and, in many ways, a different business model from a trade publisher; and so forth. General trade publishers are, in my opinion, the most challenged of all by digital change. They have the superficial advantage of having their marketplace “go digital” later than all the others, so there would seem to be an opportunity to learn from the mistakes and the successes of others. But that advantage is illusory because of unique aspects to trade. * they have agents, who have their own challenges (unless they represent one or more of the biggest authors and even that model might be threatened as more digital change evolves) while they add complications for publishers trying to find their way to new models with uncertain costs and revenues. Trade publishers, much more than their counterparts in school, college, academic, and professional, are bound to the format of “the book”. That is partly because the “value adds” that other publishers can use to justify different (higher) pricing are not natural adjuncts to trade books. Trade publishers can’t boost prices and margins by adding homework helpers as is done for school books, self-testing as is done for college texts, and value-added aggregation, searching, and productivity tools as is done for academic and professional publishing. So the lessons being learned by other publishers just don’t port to trade, any more than the new paradigm for music (give away the content to sell concert tickets) can transfer to books. Even within trade publishing, there are distinctions that matter. The business of the Big Six general trade houses is quite different than the niche (sometimes called “enthusiast”) businesses run by publishers like F+W Media, Chelsea Green, or Hay House. Niche publishers who have depth of content in verticals can do things that the general trade houses just can’t. For example, F+W Media has refocused its company around verticals. They used to see magazines and books as the businesses they were in with titles related to crafts and writing; now they see crafts and “writing” as the businesses they’re in with books and magazines in each. That enables them to share marketing costs across many books and magazines and it enables them to market much more effectively to the markets they serve. 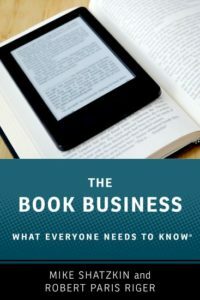 F+W’s book business is challenged by all the same factors as everybody else’s, but reinforcing their vertical organization creates alternatives, sometimes allowing them to convert essentially consumer audiences to professional audiences so that tricks from other publishing businesses can apply. Here’s a recent anecdote that, for me, sums up the uniqueness of our challenge. In a recent conversation with a very sharp and Senior Marketing Person at a major house, I raised a pet question of mine these days. “What’s the new ‘standard treatment’ for a trade book?” Used to be galleys to selected pre-pub review media, a press release with and without review copies to lists of varying sizes and care of curation, size of the catalog page, and then things we can do for all mysteries, all cookbooks, etc. What should it be now? So SMP says back to me, “there isn’t one.” But there has to be one, I said. Because only 10% of the books are going to get any unique marketing effort, so 90% have to get something standard. What should it be? If PW and The NY Times and the list of review editors at the various papers and the “usual suspects” aren’t the right thing to do anymore, what is? Or do the 90% get nothing? What that captured for me is that the Achilles heel of trade publishing has always been that publishers have to reach audiences as numerous as the books they publish and they have mostly marketed books one-by-one, book-by-book. That’s what no other branch of publishing would even attempt. Marketing effort per title is the real point of scarcity in this business — more than quality product and more than shelf space. People outside the trade don’t think about that because, frankly, it’s a problem that doesn’t occur anywhere else. But it’s in our industry’s DNA. And we’re going to have to create some unique answers.